I may change the name of this blog to The Korean Auto Marketing Blog after the past couple weeks. Seems everything I’m covering is from Kia or Hyundai. It’s just that these two companies have been actively launching several new initiatives in the online space. This time the focus is Hyundai. Hyundai has been running their latest $1.49 gas for a year campaign since it had promoted multiple extensions from their highly successful Hyundai Assurance campaign, that guaranteed loan payments for the laid off. 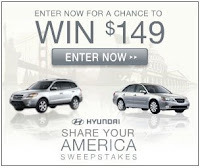 TV spots for the $1.49 gas for a year have been running for a couple months now and Hyundai is branching out online with some new media placements promoting a $149 sweepstakes. 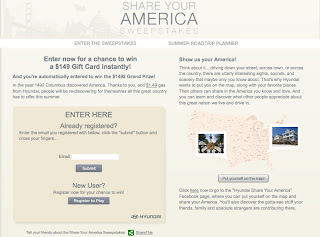 The sweepstakes asks participants to share a photo of somewhere in America where they have a story to tell. The “Share Your America with $1.49 Gas” landing page links out to a Facebook application with a Google Map and some form fields and a place to upload a photo. Filling out the form and uploading a photo for the contest entry was easy. What wasn’t, was trying to navigate the Google Map that showed photos uploaded by other contestants. Unfortunately, the map took several minutes to adjust between each zoom, causing me to wait and wait to see others photos. Why would I look at other photos, curiosity but really there is no reason to check them out. A better feature would’ve been letting me see my friends entries to the contest to read their Share America stories, but this was not offered. Seems to me there is very little for the end user, except the possibility to win the contest. Looking at other’s photos and brief descriptions was rather boring and something I doubt anyone would do again. Few entries existed as of this evening, maybe 40 or so, leaving me some hope that I could win a $149 gift card. They are promoting the contest through a Twitter campaign account @roadtrip149. The Twitter account is your typical lame marketing execution. The account keeps searching Twitter for “road trip” and sending Tweets, to anyone using that phrase, the following message: “Our map could use your great road trip pics! post them here http://bit.ly/2ObsVM”. Why is the Twitter execution lame? Because it is just an account that doesn’t engage in conversation or contribute anything more than noise pointing people to the campaign’s website. That said 174 people are still following the account to see if anything interesting develops. After my entry was accepted the next morning, the post to the Facebook application did not show up in my News Feed on Facebook, thus limiting the reach of the campaign. You would think contest entry would at least ask me to “Publish” my entry so others in my social network could engage and learn about my sharing of America. Seems like a missed sharing opportunity for this Share campaign.